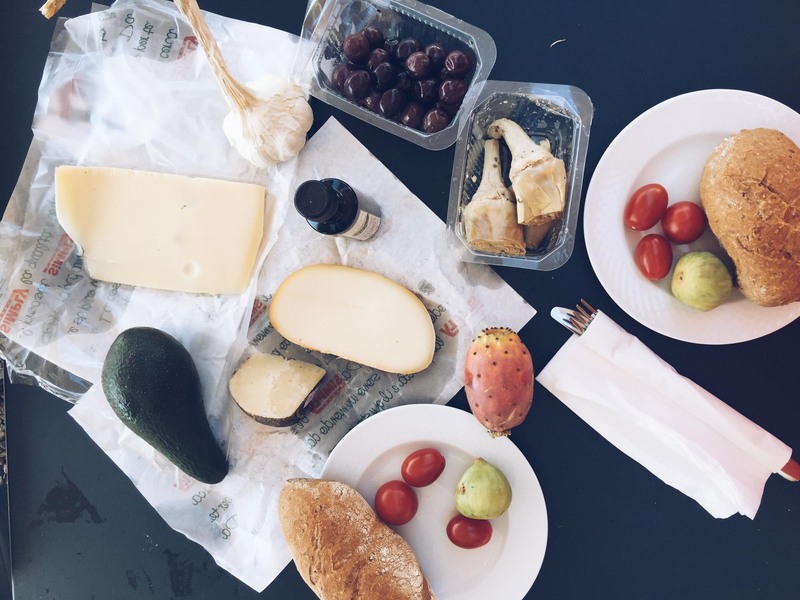 What food to avoid when pregnant in Italy? Italian food makes me giddy. I’m obsessed. 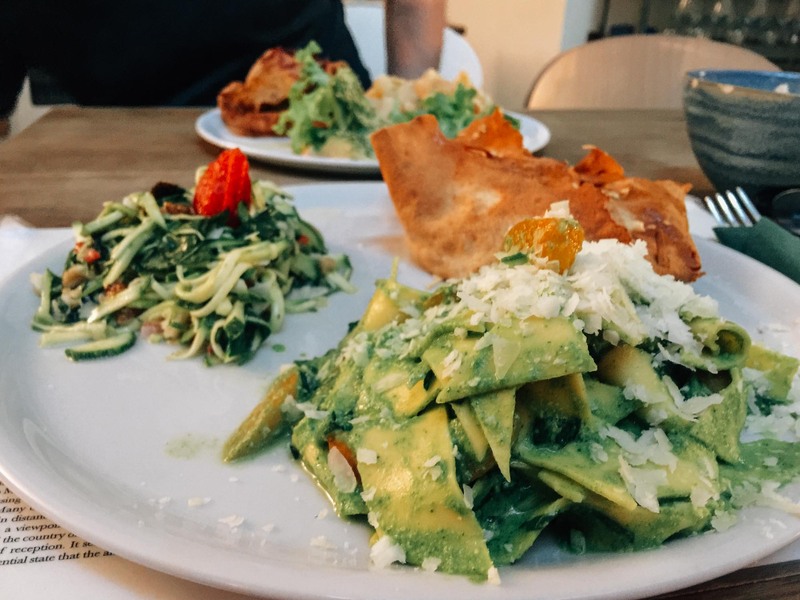 The pizza, pasta, gelato, wine and coffee are among my favourite foods in the world. It’s one of the reasons Steve and I return to Italy again and again and ended up choosing to go there for our babymoon. But one of the things I was worried about was how being pregnant would affect the foods I could eat. 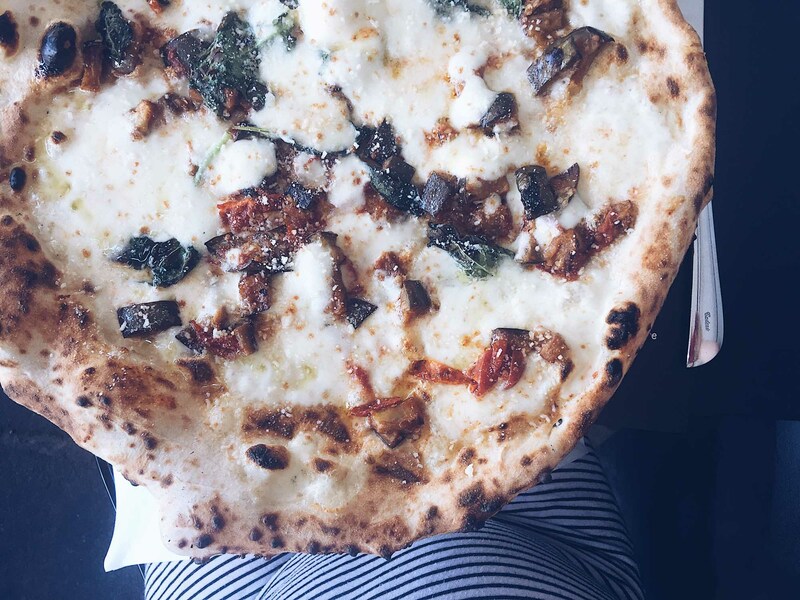 I struggled to find straight-forward information online, so here’s a post rounding up the dos and don’ts of eating when pregnant in Italy. 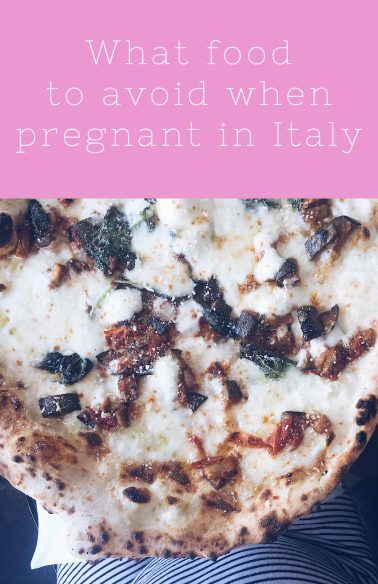 First of all, bear in mind that the rules about what you should and shouldn’t eat during pregnancy differ around the world, so the guidelines in Italy might be different to your home country. It’s therefore no use to tell a waiter, cook or hotel you’re pregnant and expect them to know what you can and can’t eat. Instead you’ll need to check yourself. If you’re worried people aren’t taking you seriously, then a good trick is to say you’re allergic to whichever ingredient you’re concerned about. 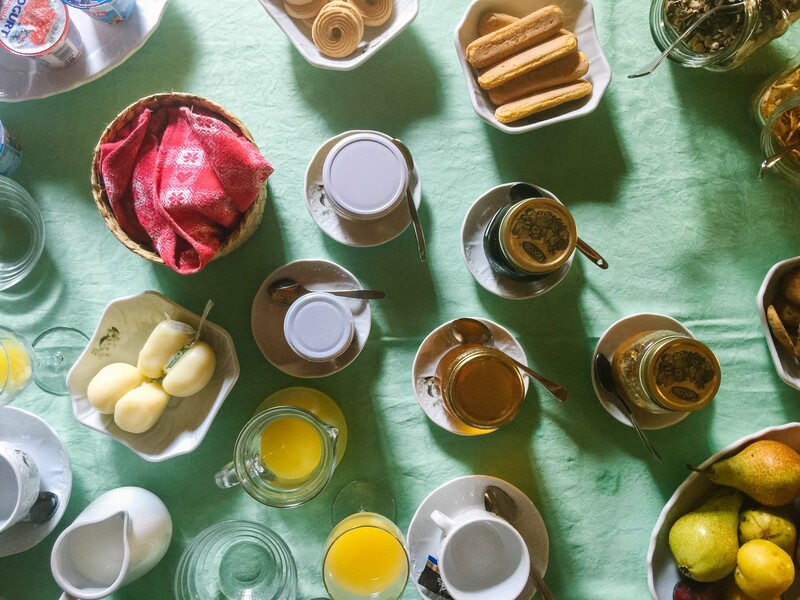 Not only do rules differ around the world, but people’s own approach to those rules vary too. Some women are happy to have the odd sip of wine here and there while others won’t touch it at all. Some eat raw eggs, others don’t. And if you delve into the internet you find a mind-bogglingly array of conflicting advice and research. Ultimately, it’s a personal choice and for the purpose of this post, I’m following the NHS’s guidelines, which you can find here. In the UK, we’re advised to avoid mould-ripened soft cheese, soft blue cheese and unpasteurised soft cheese due to the risk of listeria. Thoroughly cooking these cheeses kills the bacteria, so, for example, unpasteurised mozzarella on a pizza is fine and so is goats cheese if it’s cooked through. However caprese salads are out unless you know the cheese was pasteurised. We found that in most cases it wasn’t, so despite being in the home of fresh buffalo mozzarella, I sadly had to abstain. 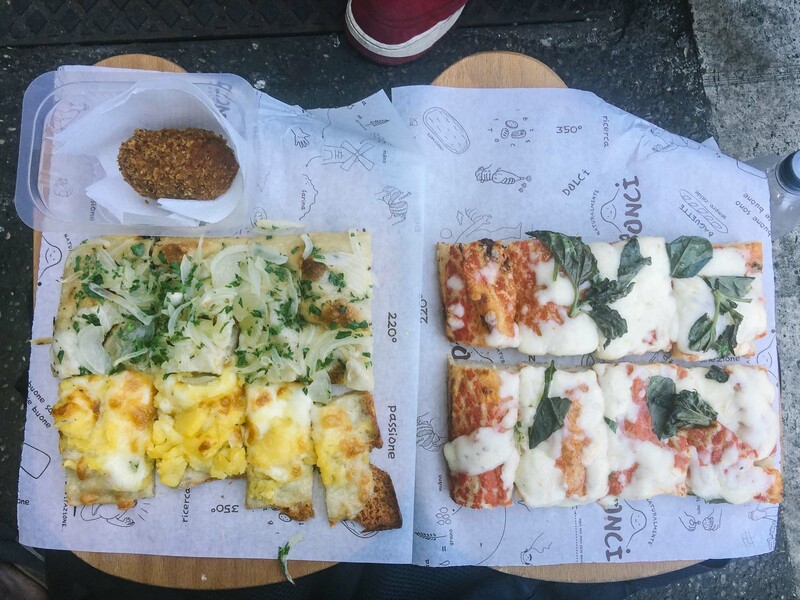 A lot of pizzas and pasta dishes are also served with raw mozzarella, so look out for that too. On the bright side, all hard cheese, including unpasteurised varieties, is safe, so you can eat all the parmesan you like. As I said before, not everyone follows this, but the NHS advises avoiding partially cooked or raw eggs to avoid the risk of salmonella. 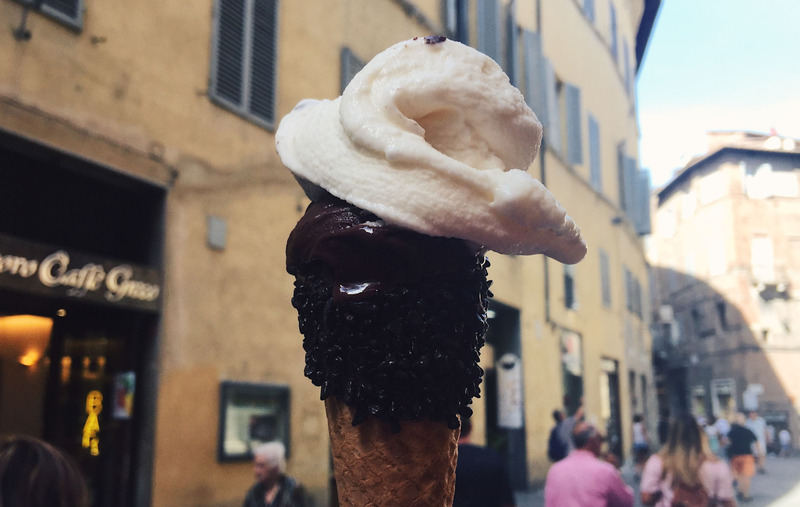 I found that the main places to look out for these in Italy were desserts, pizza toppings and gelato. Tiramisu uses raw eggs and so does mousse. 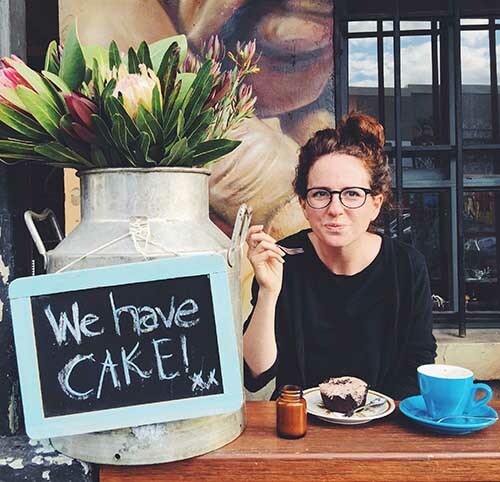 Ask about other desserts if you’re unsure. Although, unlike ice cream, gelato isn’t traditionally made with raw egg, there are some flavours that do include it. We always asked in each gelateria, and found that it tends to be the creamy, yellow-coloured gelato that includes egg, for example crema or zabaglione. Some people say the temperature of the gelato kills the bacteria, but I couldn’t find anything to verify this and the NHS says not to eat ice-cream made with raw egg, so I decided to stay on the safe side. There was plenty of gelato I could (and did) eat – in fact I had a gelato every day! Also, while fresh pasta is made with egg, when you eat it it’s been cooked through, so that’s on the safe list. I didn’t come across an vegetarian pâté on our trip, but again it’s on the list of things to avoid. That applies to meat pâtés too. I’m vegetarian so didn’t need to worry about this, but it’s advised to avoid all raw or undercooked meats, so no carpaccio or rare steaks. And cold cured meats are also an issue – it’s advised that you freeze them for four days before eating to kill off parasites, and that would be hard to check with a restaurant – that means it’s likely best to avoid cured meats such as parma ham, pepperoni and chorizo unless they’ve been cooked thoroughly or you know for sure they were frozen for four days first. And also avoid liver and game. Again, this didn’t apply to me, so I know very little about the rules on fish and shellfish. I’d recommend looking at the NHS guidelines for more details. 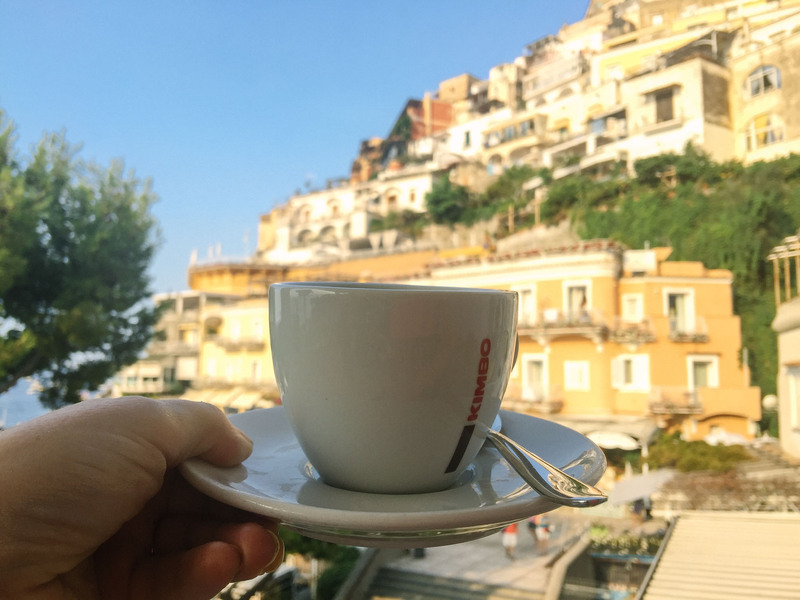 Another one of Italy’s treats to consider is coffee. The recommended guidelines in the UK are to limit your intake to 200mg per day. A filter coffee is estimated to include 140mg, so one coffee a day should be fine. But also bear in mind that other things, such as soft drinks, tea and chocolate, also contain caffeine, so it has to be a balancing act. I had a few macchiatos while there, but tended to stick to decaf. And finally there’s the wine, spritz’, prosecco, limoncello and all the other alcohol Italy is famed for. Again, the rules on this differ around the world and it’s not unusual for many European women to have the odd glass of wine in pregnancy. But, even if you’re okay with a sip/glass here and there, this won’t be a holiday where you’re indulging as you please. A good idea is to buy a few bottles from the places you visit and take them home with you – something to savour and celebrate with once the baby arrives! Do you have pasteurised cheese? : Hai del formaggio pastorizzato? Did you eat salad in Restaurants? Did you ask if they were well washed? I did eat salad. 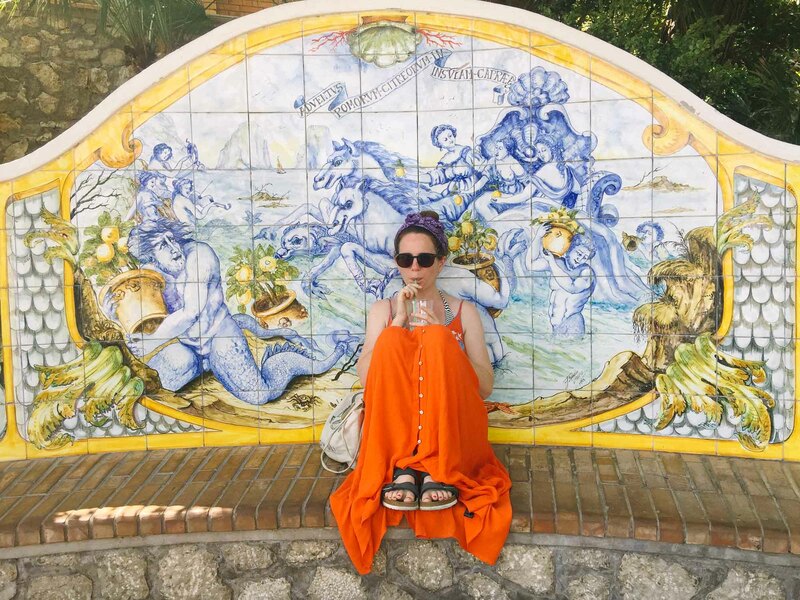 The water is safe in Italy, so I treated it the same as I would in the UK. Glad the post was helpful!